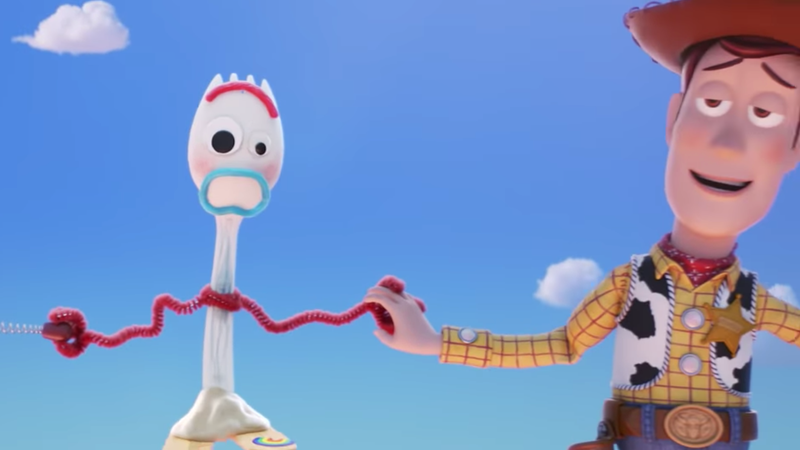 What's Up With This Fucked Up Spork in Toy Story 4? In the new minute-and-a-half long teaser trailer for Toy Story 4, Pixar introduces us to a new character—a fucked up spork with pipe cleaner arms named “Forky” who spends his all-too-brief appearance in the clip screaming, “I don’t belong here!” and “I’m not a toy! Ahh!” whilst ruining everyone else’s fun. Nearish the end, Woody (Tom Hanks) yells, “Hey hey, somebody get him before he pokes an eye out,” while Joni Mitchell’s “Both Sides Now” soundtracks the sweet, sweet chaos. As for Forky, well, I’m now accepting payment for the blatant ripoff of my likeness. Sounds like Cooley wants to mess with kids’ heads, but isn’t that every Disney movie? You’re guaranteed a good laugh and cry in most of them, but this installment might just paralyze us all with fear. It’s a fear we’ve pondered quietly to ourselves: Do we belong here? What if we don’t? Can we serve more than one purpose? What if everyone is just a terrified, mis-identified utensil after all, floating through the sky, looking for a hand to hold?